Give This Place Some Style! The completion of the siding marks the point that the outside of the house looks almost complete. Its now a �real house and you can easily envision coming home to it every day. The finishing touches on the siding include the addition of the shudders and window trim that give the house a complete� look. The crews worked diligently to complete their work and upon inspection was of a high quality. We were quite pleased with the results. The oldest type of siding that is still being used today is wood primarily because it is comparatively the easiest to install and it costs the least. It is also the most susceptible to damages from various causes such as the weather, insects, and others. It requires more frequent and regular checkups and maintenance. After wood, aluminum siding is the next option available. It is more durable than wood and can last for several decades intact with proper maintenance. Paint damages including discoloring and dents are the most common problems associated with this type of home siding. Problems with pests are practically non-existent. Aluminum also can also deal with the elements better than wood. Vinyl is the most popular form of siding used currently. It is very sturdy and with minimal maintenance, it can virtually last a lifetime. It also costs less than aluminum. The only drawback, however, is that it could get brittle when exposed to extreme weather conditions. It is therefore not advisable to use in areas where the weather can be extreme. Cement fiber is the newest in home siding innovation and comes in more varieties than other types of home sidings. As a home exterior, it is practically immune to all types of damages. However, cement fiber is a lot more expensive than wood, aluminum, or vinyl. Manifestation of insects and other types of pests - This is common only in wood sidings. With regular checkups, you can spot areas that are being attacked by termites. Splitting edges - This is seen most commonly on vinyl sidings. Temperature changes can cause vinyl to expand and contract which can cause the edges to breakup and split. If you have vinyl siding, this is the sign that you have to watch out for. Rotting signs - Wood and aluminum sidings are prone to this, which is usually caused by extreme weather conditions. Regularly inspect your home siding for parts that are beginning to show signs of rotting. Dents - Because of its comparatively fragile make up, aluminum is most susceptible to dents. When trying to identify problems with your aluminum siding, check from different angles for any uneven areas. Chipped paint - This can happen for all types of home sidings over time. Various weather conditions can cause paint to chip. This is also easy to spot and identify with regular checking. On your own, you can easily identify problems with your siding if you know how. Although you may not need a professional to determine problem areas, applying the remedies may be a different matter. You will need professional help in some cases to prevent the damage from getting worse. 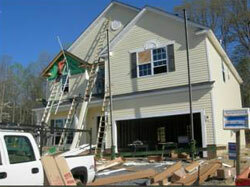 There are times when the damage can be fixed by simply replacing one or two pieces of siding. However, there may be times in which the siding must be replaced in a large area of the house to avoid the replacement pieces being a different color than the already faded pieces that will remain. It is best to contact a professional to guide you in the right direction and help you determine the most cost efficient means to repair the damaged siding.